One of our development servers today needed to be configured to send emails from our web site to users and staff within the organization. We knew that the application was coded properly, as the email piece was functioning on other servers using the same code base. 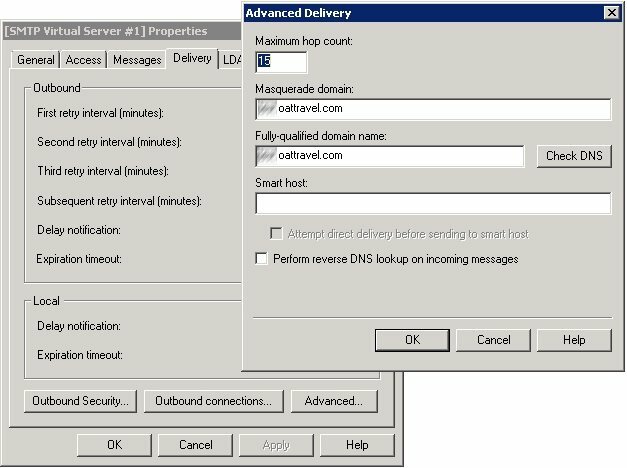 Within Windows Server 2008, you must first add the IIS 6.0 Manager Components. We had this piece installed and configured using the IP of the web server and the default port of 25. Everything looked fine, but for some reason email wasn’t sending. What I really needed was a way to troubleshoot the problem. I couldn’t step through the code, so I needed a way to determine what about the SMTP virtual server message delivery settings were incorrect. I then found a helpful KBA on troubleshooting via telnet. 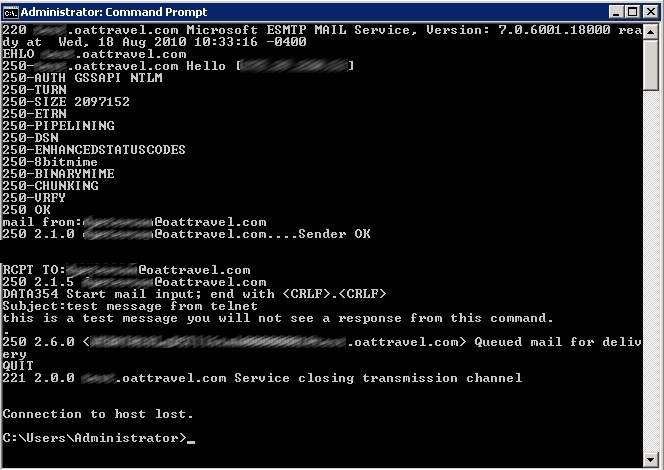 By using telnet and following the steps in the KBA referenced above, I was able to see at which step during the email process the failure occurred. Making an EHLO command, the failure showed a domain different than what I was expecting. Instead of “oattravel.com”, I saw the name of the server. Going back into the SMTP virtual server properties, I quickly realized where the problem was. After changing the settings above, then retracing the steps to telnet back into the server and send an email, I then got a successful “Queued message for delivery” status. One last note… make sure your SMTP Service is set to start up automatically. Ours wasn’t. For every IISRESET, the SMTP virtual server would stop and remain stopped until manually started again.